The Longford manager was in a relaxed mood, after his side’s hard-earned win yesterday. Glenn Ryan celebrates with his son. 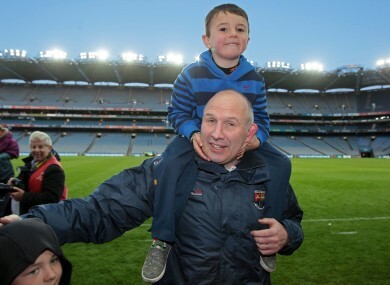 GLENN RYAN SAT with his two sons, and might as well have been talking about his plans for the rest of the weekend, so relaxed was the Longford manager. You’d never have guessed his side had clung to this title and refused to let go no matter how hard Wexford tugged and pulled at it down the stretch. Then again, he’s getting used to this. That’s two league titles in as many years and who would have guessed a footballing footnote like his adopted county are now a side with serious championship aspirations. They take on Laois in the Leinster Championship in a few weeks with so much more than the usual puncher’s chance but while the first half here showed why they might win that game, the second half showed why they might lose it. “We played well in the first half, poorly in the second half,” said the Kildare native. “But look, it’s great that we hung on and I actually thought we’d need an extra score towards the end. Our fellas showed great willingness to work hard and be disciplined when we could have given away some very handy scores towards the end. I was delighted the way we approached the final few minutes even though we were on the back foot. It was disappointing after the break but by God, the overriding emotion is we are delighted and there are plenty of things we need to work on, which is great. Asked about the importance of Michael Quinn, the former Essendon Bomber who returned this year and put in a performance at six that Ryan would have been proud of in his best years, the manager was typically evasive. “We can’t start highlighting individuals. We are a small county and we’ve to get the best out of the lads we have whether they are number one or number 31. That’s the difference with us. Michael Quinn has added a lot, guys coming through from minor and under-21 have added to things too and that’s all key. Had Michael Quinn been here one or two years ago, maybe he wouldn’t have been the outstanding player he is because the guys around him wouldn’t be there. But we are delighted to have each and every one of them no matter who they are. We are so happy with the effort they all put in out there today. Finally, you ask Ryan about the fact he is now in charge of a Division Two side. And forget about the title for a moment, as hard as that may be, but regarding the future of Longford football his answer here is the greatest cause for optimism for those in the tiny county. Email “GAA reaction: Ryan bemoans 'poor second half,' despite victory”. Feedback on “GAA reaction: Ryan bemoans 'poor second half,' despite victory”.